Lily by Frank Whiting Sterling Silver Gravy Ladle 6"
Lily by Frank Whiting Sterling Silver Gravy Ladle 6 in the pattern Lily by Frank Whiting. It is not monogrammed and is in excellent condition.Multiple quantities (of most items) are in stock. To order more than one, increase the quantity in your shopping cart. 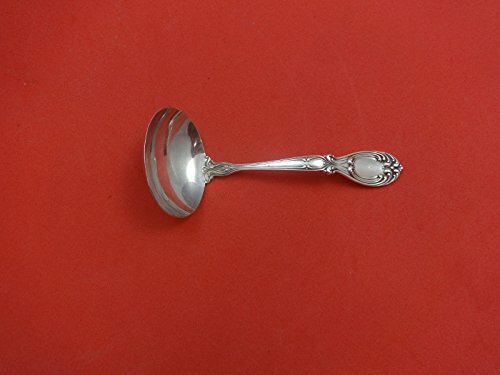 Check out our weekly talks on antique and rare silver on YouTube: VICTORIA by FRANK WHITING Sterling silver MUSTARD LADLE custom made 4 1/2 in the pattern VICTORIA by FRANK WHITING. It is not monogrammed and is in excellent condition.Multiple quantities (of most items) are in stock. To order more than one, increase the quantity in your shopping cart. KINGS COURT BY FRANK WHITING Sterling silver hollow handle with stainless implement PUNCH LADLE 13 3/4 TWIST HANDLE CUSTOM MADE in the pattern KINGS COURT BY FRANK WHITING. It is NOT monogrammed and is in excellent condition. THIS PIECE IS LARGE AND IMPRESSIVE!Multiple quantities (of most items) are in stock. To order more than one, increase the quantity in your shopping cart. 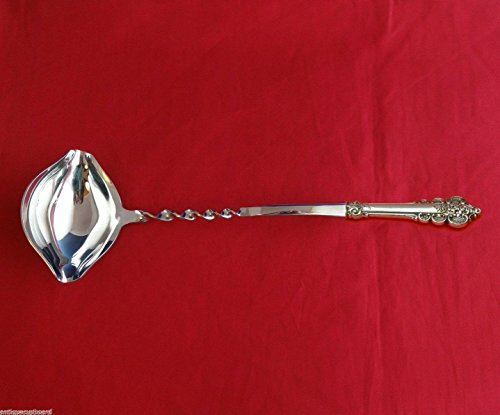 VICTORIA aka FLORENCE BY FRANK WHITING Sterling silver hollow handle with stainless implement PUNCH LADLE 13 3/4 TWIST HANDLE CUSTOM MADE in the pattern VICTORIA aka FLORENCE BY FRANK WHITING. It is NOT monogrammed and is in excellent condition. THIS PIECE IS LARGE AND IMPRESSIVE!Multiple quantities (of most items) are in stock. To order more than one, increase the quantity in your shopping cart. BOTTICELLI BY FRANK WHITING Sterling silver hollow handle with stainless implement PUNCH LADLE 13 3/4 TWIST HANDLE CUSTOM MADE in the pattern BOTTICELLI BY FRANK WHITING. It is NOT monogrammed and is in excellent condition. THIS PIECE IS LARGE AND IMPRESSIVE!Multiple quantities (of most items) are in stock. To order more than one, increase the quantity in your shopping cart. Victoria-Florence by Frank Whiting Sterling Silver Gravy Ladle 6 1/8"
VICTORIA - FLORENCE BY FRANK WHITING Sterling Silver GRAVY LADLE 6 1/8 in the pattern VICTORIA - FLORENCE BY FRANK WHITING. It is NOT monogrammed and is in excellent condition.Multiple quantities (of most items) are in stock. To order more than one, increase the quantity in your shopping cart. Troubadour by Frank Whiting Sterling Silver Gravy Ladle 6"
TROUBADOUR BY FRANK WHITING Sterling Silver GRAVY LADLE 6 in the pattern TROUBADOUR BY FRANK WHITING. It is NOT monogrammed and is in excellent condition. Multiple quantities (of most items) are in stock. To order more than one, increase the quantity in your shopping cart. Marquis By Frank Whiting Sterling silver custom made Mustard Ladle 4 3/4 in the pattern Marquis By Frank Whiting. It is not monogrammed and is in excellent condition. What is a custom made piece?Custom made pieces are made from an original piece in your pattern that are not otherwise available or difficult to find on the market, especially in discontinued patterns. Hollow handle items are made from an original handle in your pattern with a new stainless implement. Then the piece is hand-finished by a highly skilled silversmith in the USA. All custom orders are made-to-order and usually ship within 5-7 business days. Now that many patterns have been discontinued, custom pieces have become a staple in the silver industry and are widely offered by mainstream flatware dealers.Multiple quantities (of most items) are in stock. To order more than one, increase the quantity in your shopping cart. 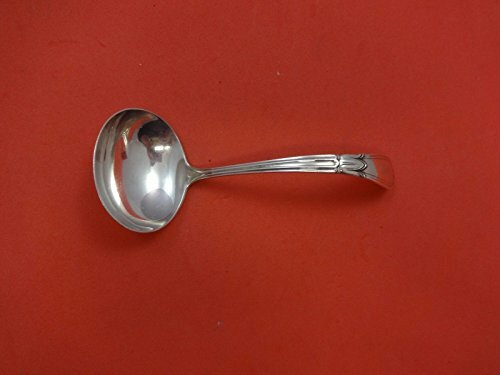 Botticelli by Frank Whiting Sterling Silver Gravy Ladle 6 1/2"
BOTTICELLI BY FRANK WHITINGSterling Silver GRAVY LADLE 6 1/2 in the pattern BOTTICELLI BY FRANK WHITING. It is NOT monogrammed and is in excellent condition. Multiple quantities (of most items) are in stock. To order more than one, increase the quantity in your shopping cart. LILY BY FRANK WHITING Sterling silver hollow handle with stainless implement PUNCH LADLE 13 3/4 TWIST HANDLE CUSTOM MADE in the pattern LILY BY FRANK WHITING. It is NOT monogrammed and is in excellent condition. THIS PIECE IS LARGE AND IMPRESSIVE!Multiple quantities (of most items) are in stock. To order more than one, increase the quantity in your shopping cart. Copyright © Wholesalion.com 2019 - The Best Prices On Frank Whiting Ladle Online.